Over 100 million customer reviews can be found on Yelp. Yelp quickly became successful because of the value their online reviews provide to customers. Online reviews and customer testimonials are a powerful tool to market your product or service. Purchasing decisions are directly affected by the reviews a customer reads online. In fact, 85% of customers claim to read up to 10 reviews before making a purchase. While quality reviews can help your company an ineffective review will cost you money. A bad customer testimonial can come across as bragging to your target audience. We’ve all met someone in our lives who was prone to boasting. Did you know that bragging is considered a major turn off by both men and women? Boastful testimonies are a waste of space and can negatively impact your conversion rates. However, when done correctly, website testimonials can be a goldmine for your company. Customer reviews are particularly effective because of the story they tell. Since childhood, people enjoy hearing stories that evoke a feeling. A good testimony tells an emotional story about a customer’s experience. The best testimonial examples will touch, move or inspire your readers. Continue reading to learn how to display your customer testimonials in a powerful and classy way. There thousands of different types of testimonial examples. The examples used for this article will all have a similar purpose. Any review you post has to strike an emotional chord in the reader. Humans make decisions based off of feelings not facts. Facts and figures play a part in decision making but feelings are a bigger influencer. Keep this in mind when choosing the customer stories you want to share. Stories that have emotional components are more likely to resonate with the readers. A story about a happy customer is nice but also ineffective. A better approach is to use stories people can relate to. Relatable stories will have characters your readers can identify with in some way. First, let’s review the 3 types of quote testimonials. The first is simply a quote without any photos or calls to action. Using a quote is a great option when you don’t have a lot of complete customer reviews. You’ll be able to craft an article that fits around the quote itself. You should also create a way for customers to rate your product. Displaying your company’s rating along with a quote will improve your credibility. Using a 1-5 star rating system is the most popular option for companies today. We recommend using a star rating system so that readers can quickly assess your value. Another way of posting quotes is to use an image of the customer. Remember, your readers will respond best to a short story. Just like with children’s books, pictures bring a story to life. Pictures also help improve the credibility of the testimony you post. Your conversions will be much higher when consumers feel they can trust you. Finally, you can post a testimonial quote with an image and call to action (CTA). A CTA tells the customers what they should do next. You’ve already grabbed the readers attention now you have to direct them to your product or service. Be careful to avoid sounding overly salesy of pushy with your CTA. Instead, you should position yourself as helpful, not insistent. A helpful CTA would read something like, “Click here to learn more about this product”. Then you can include a convenient link for customers to click on. The link should always take your customers to the product or service mentioned in the quote. Never mislead a customer with a link that directs them to an unrelated site. Do you remember who the popular kids were in high school? Influencers are a lot like popular high school students. The choices they make can create trends and instantly generate interest. The tricky part for you will be identifying who influences your target audience. Once you know who your consumers identify with you can reach out for a review. Oftentimes influencers are hard to track down or hire for a review. One method of recruiting an influencer to do a review is by giving them free products. Contact the authorities in your industry and ask if they’d be willing to try your product. Chances are they will be happy for the opportunity to try something for free. Ask the people you give your product to be completely honest when writing their reviews. It’s important you really know how they feel about your product or service. False or misleading reviews will only end up driving customers away. You can prevent this by simply being the best at what you do. As you produce quality products and services the quality reviews will come. Video testimonies are one of the best ways to create feelings and emotions! Video marketing is the strongest tool available to promote your brand awareness online. By the time we are in 2019 80% of online traffic will come from videos. All you need is a smartphone and a simple video editing application to get started. A great way to begin is by asking customers to record testimonies on their smartphones. Customers will be less nervous when they can record themselves rather than being recorded. It’s important for the customers to be relaxed so that their testimonies are believable. You can help inspire the consumer’s review by providing them with a list of questions. We recommend you ask customers what they enjoy most about your brand. You can also ask customers to record themselves using your product or service. Video reviews are also great for creating reverse reviews. A reverse review starts off with the customer saying how skeptical they were about your company but ends with the customer loving your product. Now you can start creating quality testimonial examples. 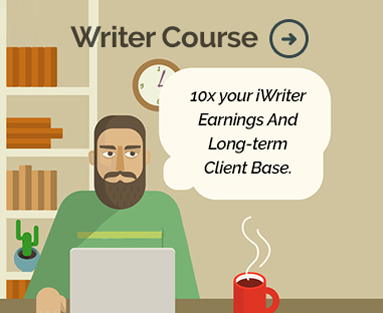 iWriter is here to help you grow your business with quality content. We offer a wide variety of content ranging from 150 words all the way up to 35,000 words in length. Whatever topic you need an article on, we’re here to help! You can visit our blog for more helpful articles or contact us directly. We are happy to answer any of the questions you might have. Start your free account with iWriter today!